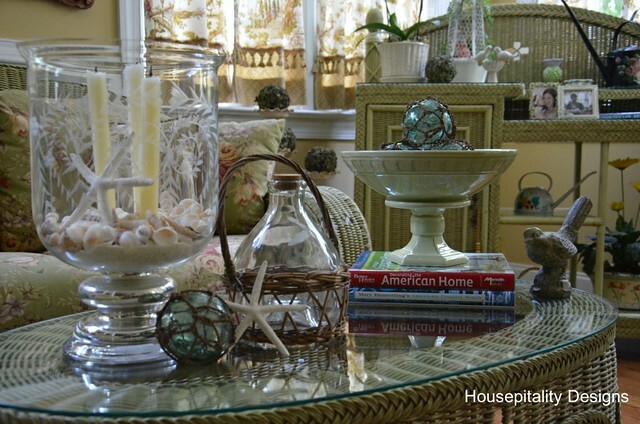 You all know the fabulous Kim from Savvy Southern Style... .....her blog and home are magnificent! When Kim asked me if I would like to participate in her "Favorite Room Feature".... .....my jaw dropped....my heart skipped many beats! Yes!! !...I would love to!!! 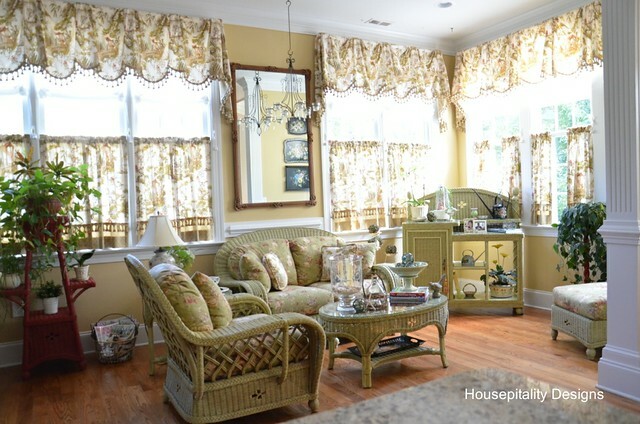 So, thank you Kim for inviting me to your very special feature of "My Favorite Room" I present to you, my favorite room.... ..........my sunroom/keeping room. The room where I love to retreat with a cup of tea... .....and a great magazine. So do ya notice the magazine?.... .....Cottages and Bungalows...the issue where Kim's beautiful powder room was featured! I love this room.... .....as it is a room where I feel at peace.. ..........and it makes me smile every time I sit in the room. It's a place where my plants thrive.... .....as they are happy too! This room makes me feel as if I were in Florida... .....where I had lived most of my life.... ..........then we relocated to North Carolina. This room originally had no window treatments... ....however, when the house went up next door.... .........a bit of privacy was needed. 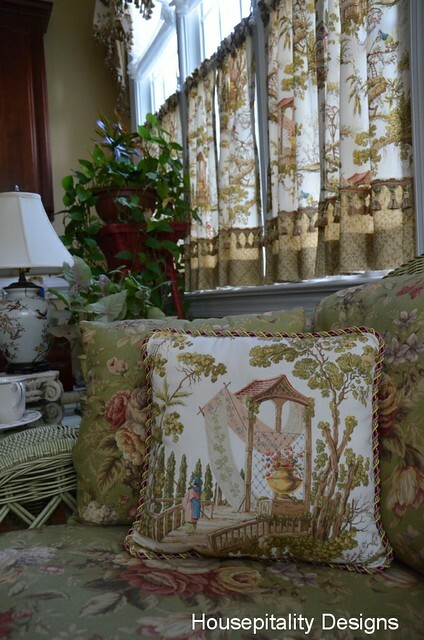 The drapery and pillow fabric is Enchanted Garden by Calico Corners.... .....I fell in love with the pattern and colors. Cannot remember the fabric that is on the furniture..... .....I believe it is a Raymond Waites pattern.. ..........It was a fabric choice that came with the furniture, which is Lane Venture. 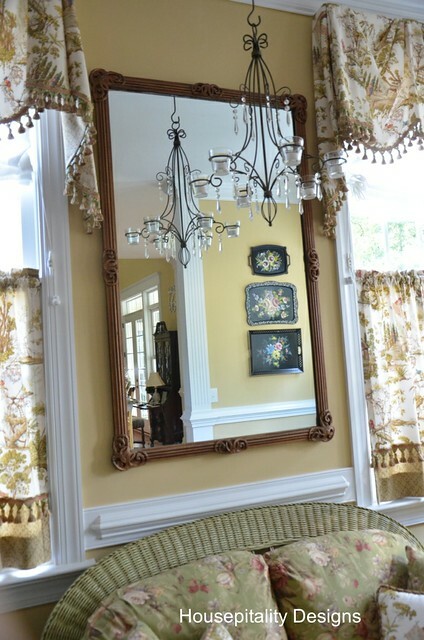 antique mirror. I love using tole trays for "art"... .....as I do not have to worry about fading. And here is my favorite piece in the room... .....I loved the finials...as you know I love pineapples! 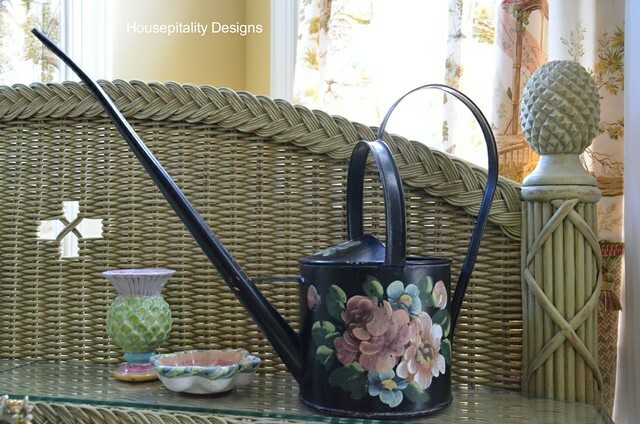 And vintage garden items... ....and my MacKenzie Childs pieces from NYC. 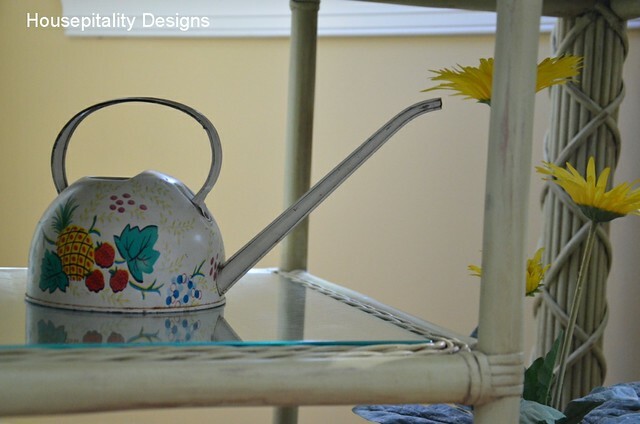 s... And my wonderful watering can with a "pineapple" on it! There's an area where I can store my Jadite... .....store cookbooks...and more dishes.. ..........and sit and write my grocery list. This room takes on so many changes during the day... .....changes in light...from the brightest of sun in the morning .........to the subtle light of the mid-day... When I am on the phone.... .....this is where you will most likely see me. In the room... .....that is really the breakast room... ..........and turned it into a sunroom/keeping room....my favorite room. Thanks again Kim, for giving me the opportunity to present "MY FAVORITE ROOM"!!! Thank you, Shirley for sharing your favorite room with us. I would love to join you in that wonderful light filled room. 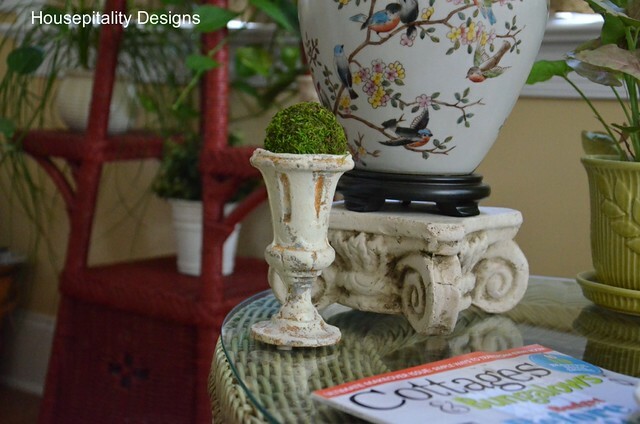 If you don't know Shirley and her blog please go say hi over at Housepitality Designs. 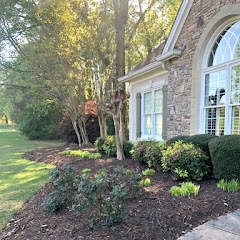 It's always a treat to see pictures of Shirley's beautiful home. I think that room is my favorite in her home too! It's so cheerful and garden inspired. That is a room to spend some relaxation in for sure. Oh my goodness! Shirley your keeping room is exquisite!!! I can understand why you want to spend most of your time in this beautiful, sunny room filled with lovely things. Kim, you have done a fabulous job introducing Shirley and her inspiration to us! That is a gorgeous room. Love it's Florida cozy feel. Kim....I cannot thank you enough for the opportunity to share my favorite room with your readers......I am so honored and truly happy that I have had the opportunity of meeting you and getting to know you!! !...Have a wonderful weekend!! This is such a beautiful room with so many different personal touches! Love the . . . curtain fabric . . . chandelier . . . wood floors . . .wicker chair . . . AND MORE! 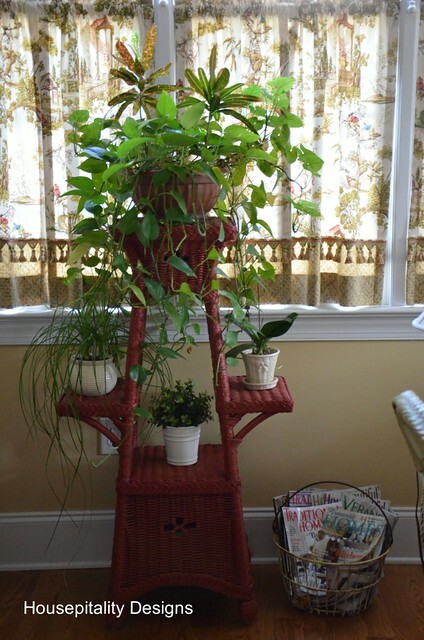 I adore Shriley and her fabulous sunroom! 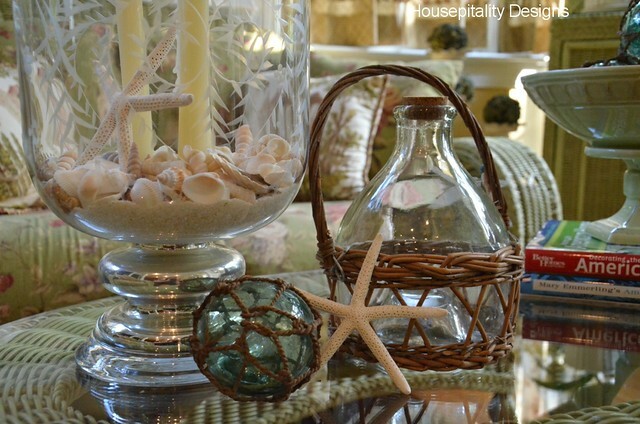 Her collections are the best: love the Jadite, tole trays and fishing floats. I can picture her there now, sipping her sweet tea and chatting on the phone. Thank you, Kim and Shirley, for sharing this lovely room. I can see why it is a favorite. The room exudes comfort and peace. 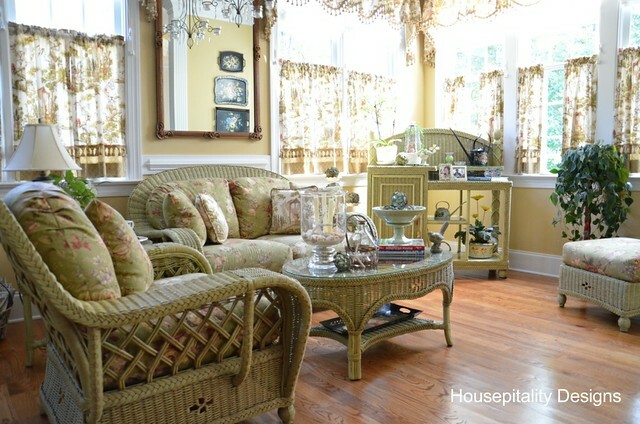 LOVE this room, the light, the fabrics and such gorgeous wicker pieces. just a perfect spot! HI Kimmie! Oh, her sun porch is just so charming and thank you for featuring her. I think this is my favorite room in your home, too, Shirley! I love everything, but your window treatments are my favorite. I have to tell you that I rethought my sunroom's window valances after seeing yours. While I'm no pro and won't ever get your look with my skills, I did bring the bottoms up from just being straight to having a curve. It definitely made them look better. Gorgeous room! I love all the fabrics and collections she has incorporated into the space to make it her own. Thank you so much for sharing this charming space with us today! Shirley your sunroom just stimulates my senses! I would love to sit and chat with you in there for hours..perhaps days, you could not get rid of me! Thanks for sharing Kim. 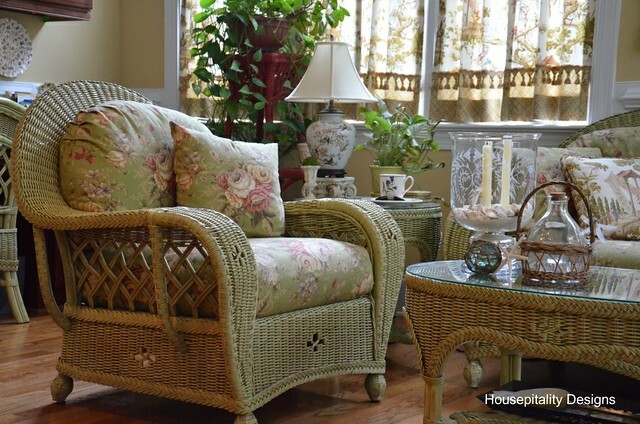 I've had the pleasure of seeing Shirley's sunroom in the flesh and let me tell you, it is truly a stunner! Her whole home is just beautiful. Congrats, Shirley, on your feature! Very pretty feature! I love all the personal details. 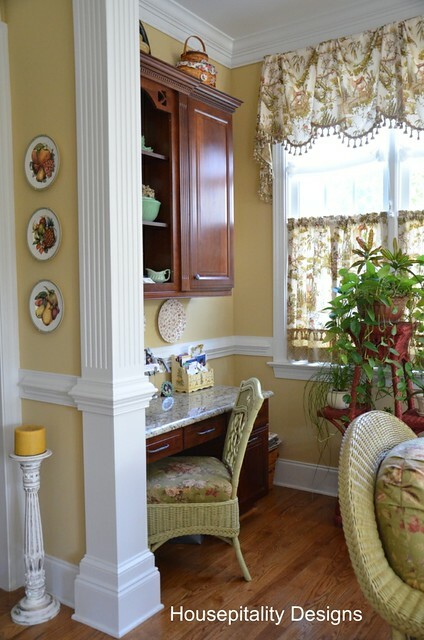 It really is a warm, welcoming room and the nook area with the desk is perfect! Kim, what a fabulous sun room. It is so inviting and pretty. I love Shirley's beautiful home! Great feature Kim! Kim, thanks for featuring Shirley's beautiful room. I just love her! That truly is a remarkable space - it is awesome. I would soooooooooooooo spend my hours there, too! Wouldn't take much to rearrange it for the perfect Conservatory Room for a ladies tea luncheon, either - all the ambience is perfect there. Well done, and huge and cheerful and feminine but not too much so - love it! I really should have said that directly to her - Kim, nice choice - she did a fabo job. What a pretty room - I'd be instantly relaxed in it. 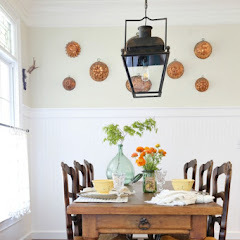 I love the way it has been re-purposed from a breakfast room. Kim, this was a great feature! 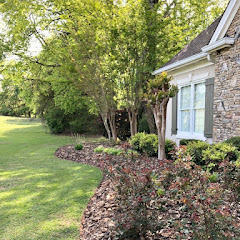 I love everything about Shirley's entire home! Just beautiful! 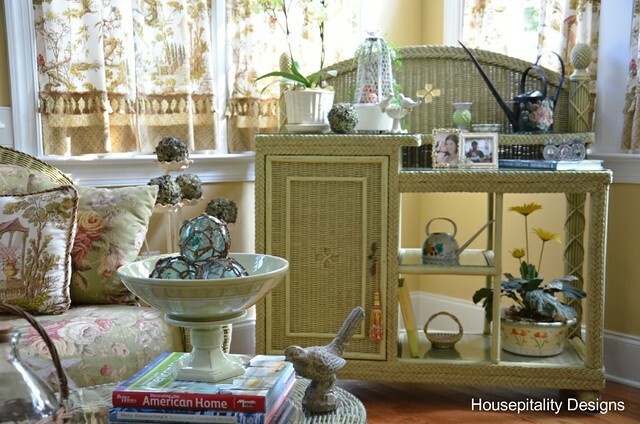 Love that wicker and all the greens, very refreshing and relaxing......just beautiful!!! It would be my favorite room also!!! This was a wonderful room to tour and I'd love to sit and have a cuppa tea in here! Thanks for hosting this great new party, its fun to see what makes a favorite room for people! I can see why you like it. Looks so cozy and welcoming. 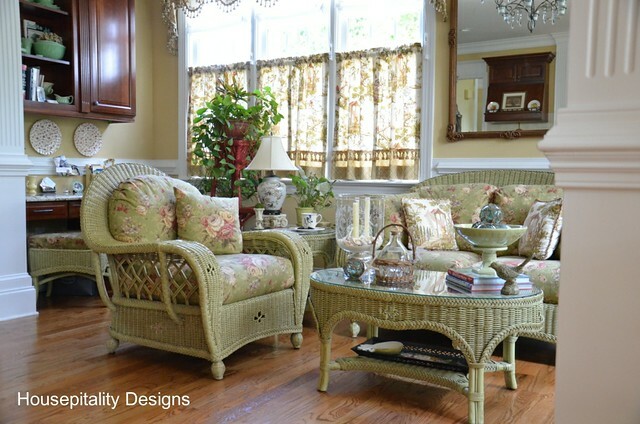 Such a luvely sun room/ family room Shirley. As one who lives in Florida, I also luv my sun room. Nothing like a cup of coffee in the morning as I watch the day unveil and be serenaded by the birds in the back garden. Thanks for sharing. Thanks Kim for hosting . Of course, it's beautiful! 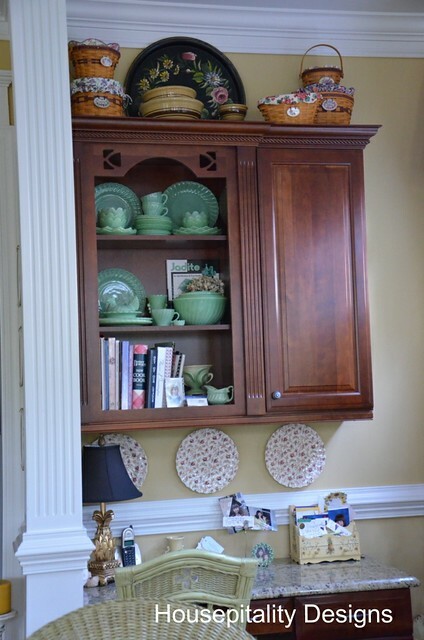 Love how Shirley layers her decorating... lots of pattern and texture and fantastic details. Thanks for sharing, ladies! I can see why this is your favorite room. It is so beautiful! I especially love all the gorgeous fabrics. Shirley, What a gorgeous restful room. No wonder it is your favorite! You have it so beautifully decorated... the colors are just perfect and your fabric is swoon worthy! 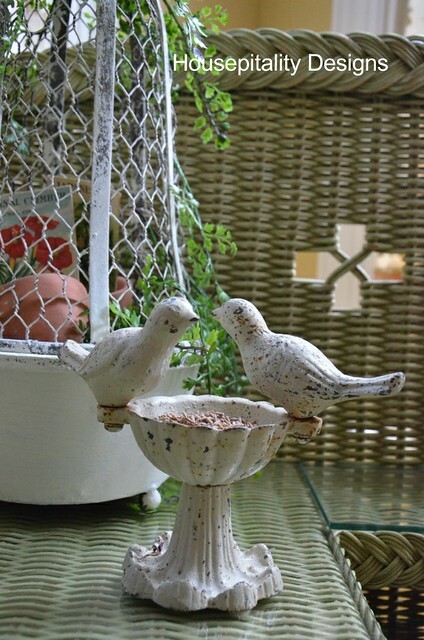 I can tell that you put so much love and care into creating your sunroom. I just loved reading how you described some of your favorite pieces! 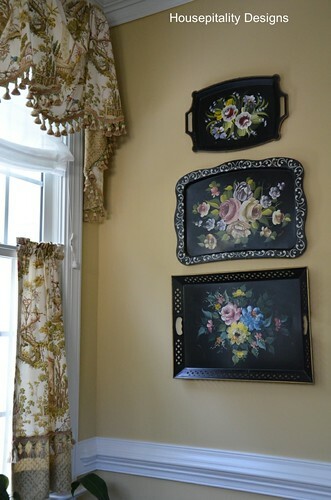 I collect tole painted trays as well. YOurs look so pretty hanging in your room! Thanks for sharing! 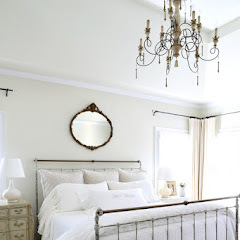 I aspire to having a room so lovely! Wow! I love it! 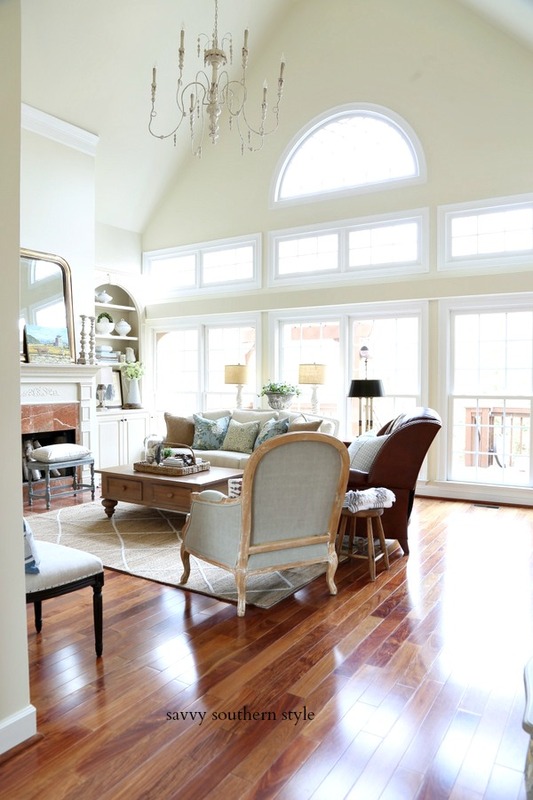 You sure know how to pick a great sunroom Kim! Thanks for sharing with us, Shirley! Shirley, this is one of may favorite rooms! 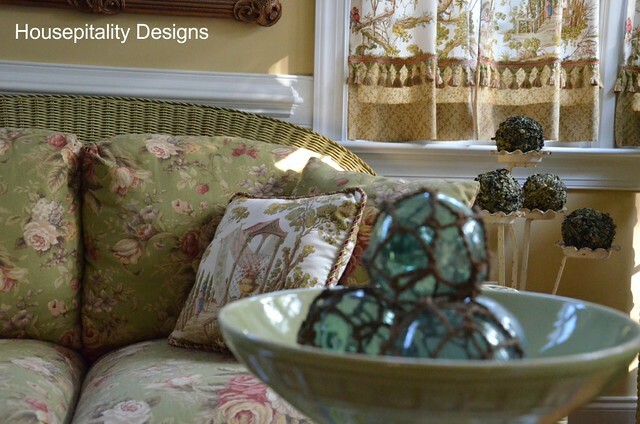 Your window treatments and furnishings are fabulous! I love the light flowing in! I think I would stay here all day! 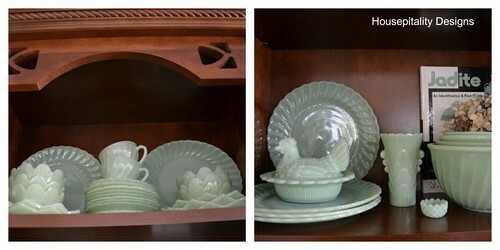 Your tole painted trays, jadeite and pineapples are wonderful! This is absolutely gorgeous! Thank you for sharing your favorite room! 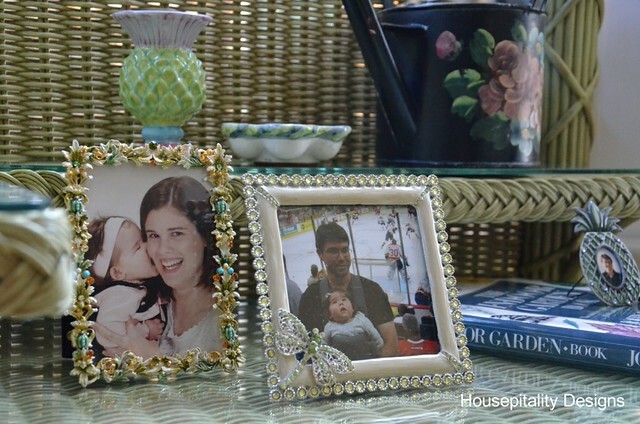 thanks for featuring Shirley's beautiful room! It looks so inviting. I'm going to pop over to her blog and it check out! What a lovely room, all of the layers and textures, it is so cozy and relaxing looking. The collections are quite fabulous too! I always say Shirley is awesome. This room, I have seen before and it is simple stunning, There is not one thing I don't love. 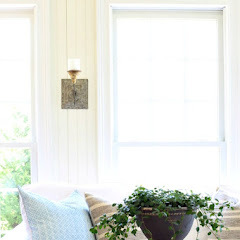 I remember seeing this beautiful sunroom -- and I think this could be anyone's favorite room. Kim, you and Shirley have the two best sunrooms I've ever seen! I can see why this is your favorite room....so beautiful and welcoming. Did you know that the MacKenzie Child's Estate in Aurora NY is for sale? 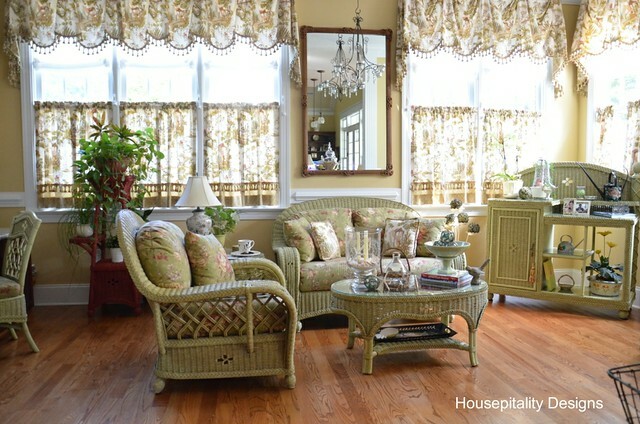 I love this room...love the color of the walls and the color of the wicker furniture. 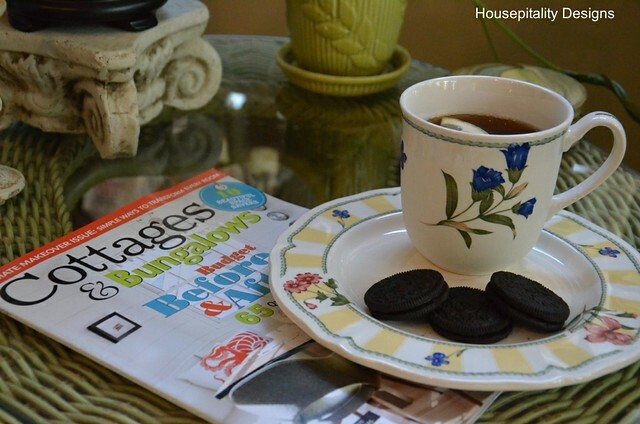 Looks like a comfy retreat at a cute B&B! 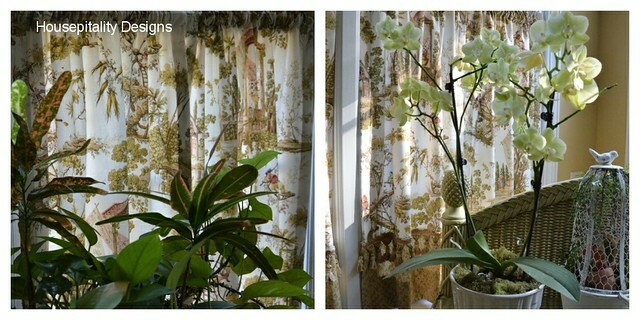 I love the colors in Shirley's room, and all those windows. Thank you for hosting her, Kim! Shirley, I am so late getting by. I absolutely love your keeping room. The furnishings the colors and you collections all say come in, have a seat and chat for a while. Thanks for sharing that lovely space. Thank you Kim, for featuring Shirley.